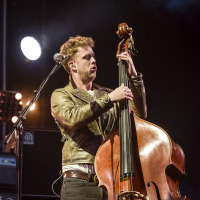 Mumford and Sons bassist Ted Dwane has helped create a new exhibition to raise awareness of the loneliness felt by people living with multiple sclerosis (MS). Mr Dwane, who has created the MS Connection exhibition with photographer Louis Browne, was inspired by his mother, Sarah, who is living with the condition. Recent research carried out by the MS Society found that three in five (60%) people with MS feel lonely because of it, with a similar amount (58%) admitting to feeling isolated. More than four in 10 (42%) said they feel both and Mr Dwane now hopes that his new exhibition will help tell the stories of those sufferers behind that statistic. Speaking about his experience, Mr Dwane said that his mother was diagnosed with MS around the time that he had started touring and his sister had moved to Australia. He said: "It was a period of huge change for my parents and we weren't there for them in the way we wanted to be. I'm still away a lot, but back then it was especially hard because my parents were just coming to terms with the diagnosis. "Having the right support can change everything, and ultimately both my sister and I made a conscious decision to move back closer to home. A lot of people with MS simply don't have that network, and can end up feeling totally left out of society." The MS Connection features 19 people affected by MS from all over the UK and was launched on Monday 3 December at The Sidings in Southwark, a venue owned by Mr Dwane's bandmate Ben Lovett. MS can affect the brain and/or spinal cord, causing a wide range of potential symptoms, such as problems with vision, arm or leg movement, sensation or balance. Issues with mobility, losing employment, stigma around disability, and a lack of understanding from loved ones can all contribute to social isolation. MS Society director of services and support, Ed Holloway, said: "Anybody can be lonely, but we know from our research that loneliness is an issue which disproportionately affects people living with MS.
"To think 60% of people with MS are lonely is shocking and we hope the MS Connection will encourage people to get in touch with us and join the fantastic community that's out there." If you're living with MS and are looking for travel insurance that's tailored to your needs, check out our dedicated MS medical travel insurance and get the best deal for you.